Power up! Take charge of your own life and be empowered to make a change! That was the message from the Women’s Center for this fall’s leadership speaker series that focused on the personal journeys of female leaders in the Hampton Roads community. Students heard from a chief judge, a community advocate for girls and from the president of TCC. Baehre-Kolovani follows many of the principles in Robert Greenleaf’s book Servant Leader. In the book, Greenleaf discusses four traits the best leaders exhibit, whether they are CEOs, teachers or college presidents. Baehre-Kolovani stressed that while each of the principles is integral for a good leader to emulate, knowing your weaknesses and asking yourself the tough questions might be the most essential. Three leaders who Baehre-Kolovani admires are Mahatma Gandhi, Martin Luther King Jr. and Nelson Mandela. “They have walked in the shoes of their followers,” says Baehre-Kolovani, who ended her talk by encouraging students to “power up,” and take action in their own lives to create change. The other speakers in The Women’s Center series were Alisa Reed-Lofton, teen program specialist for the Girl Scout Council of Colonial Cost, and Michelle Atkins, a chief judge in Norfolk. 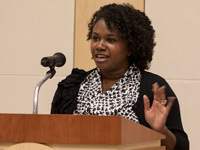 Reed-Lofton’s presentation “On Passion, Purpose and Leadership” urged students to find their passion and purpose in order to follow their dreams. 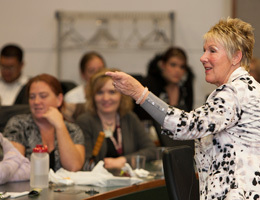 Atkins’ presentation “Make Sure You Put in the Time, Work and Effort for your Future” empowered students to pursue dreams in the face of obstacles, including class, race and gender.